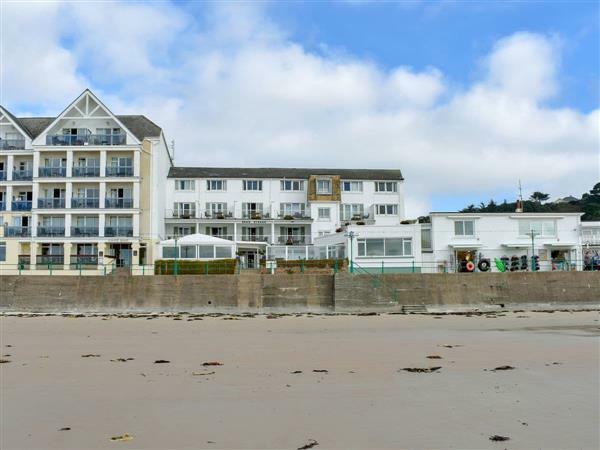 These well maintained holiday apartments have direct access to the magnificent golden sands at St Brelade’s Bay. They are just a few minutes’ drive from the shopping centre, leisure complex, ten pin bowling and several golf courses. There is a regular bus service to St Helier - Jersey’s capital. There is a lively public bar, which leads onto the seafront sun terrace, and snacks and beverages can be purchased all day and are served on the sun terrace or alfresco dining area. Guests have sole use of the roof top sunbathing area with stunning views across the bay. Beau Bistro is available for guests, with a sea view from every table, daily specials and an a la carte menu. Between the hotel and the beach a promenade extends almost the length of St Brelade’s Bay and is ideal for an after dinner stroll. Relax and enjoy the mild climate for which Jersey is famous, the Bay is south facing and very sheltered making it a natural suntrap for sunbathers. Winston Churchill Park is adjacent, and the historic fisherman’s chapel lies at the western end of the bay. When the tide is low it is possible to walk past Point Le Grouin and onto the sands of Ouaisne Bay which is noted for its nature reserve and the historic Smugglers Inn. Fishing boats are still moored by the old harbour and they sometimes land shining mackerel straight from the sea. Other places of interest must include Durrell Wildlife Conservation Trust and zoo, Jersey War Tunnels, Mount Orgueill and Elizabeth Castles. Shop 50 yards, pub and restaurant on site. The Beau Rivage offers a truly romantic setting for a small intimate civil wedding - max 60 people for 3 course meal and max 90 people for a knife and fork buffet. All properties (refs 27011, 27009 [St Lawrence]): Electric heaters, electric, bed linen and towels included. Travel cot. High-chair. Two satellite TVs. DVD. Electric cooker. Microwave. Shared laundry room. Dish washer. Fridge/Freezer. Wi-Fi. Shared conservatory/sun terrace. Roof top terrace. Shared games room with pool table. Ample parking. Welcome pack. No smoking. All on second or third floor: Living/dining room/kitchen with double sofa bed. 1 twin bedroom (can be 6ft double) with en-suite bathroom with shower over bath and toilet. Bathroom with shower over bath and toilet. Holidays at Trinity, Beau Rivage run from Saturday to Saturday. For a better idea of where Beau Rivage - Trinity is, you can see Beau Rivage - Trinity on the map below. Do you want to holiday near Beau Rivage - Trinity (27011), you can see other cottages within 25 miles of Beau Rivage - Trinity; have a look to find your perfect holiday location.